When it comes to barbecuing, people tend to have strong opinions about the best way to do things. Outdoor cooking comes with unique opportunities, as well as some challenges, in cooking to perfection. The most basic and most heavily debated question revolves around the fuel chosen to bring the heat: wood, charcoal or gas. Which Grill Is Better? You Have a Choice to Make. These decisions are easier to make in a head-to-head comparison, so, for now, we will look at wood pellets versus charcoal. Unsurprisingly, we at Memphis Wood Fire Grills prefer, well, wood. That’s not to say it isn’t worth comparing the relative merits of other methods of cooking. Depending on your situation or your preferences, charcoal grilling might be right for you. Let’s dive in. It’s always better to look on the bright side, so let’s discuss the number one positive offered by both wood pellets and charcoal: Flavor! Wood pellets and charcoal both produce smoke that imparts a delicious flavor to slower cooking meats. If you’re grilling hot dogs and burgers, you might not notice, but for foods that stay on the grill longer, it can make all the difference. When it comes to flavor, personal preference is king. Some people love the particular taste imparted by burning charcoal. Others prefer the flavors available only through burning wood. If you have a strong preference, you know whether charcoal or wood pellets are right for you. If you want to sear a steak, there is no substitute for direct heat. You can’t create that exterior crunch any other way. If your grill can only achieve temps in the 400-450°F range, you will never be able to get the kind of sear you are craving unless you are willing to cook the steak to a solid grey all the way through. Charcoal grills, when handled correctly, can easily reach the higher heats necessary to deliver that crust. While some wood pellet grills might not be able to achieve a sufficient searing temperature, Memphis Wood Fire Grills can reach 600-700°F. That means it is possible to achieve a proper sear without overcooking your meat. The ability to get that sear is an important element to picking the right grill for many. Here is where wood pellet grilling starts to set itself apart. Charcoal grills are able to impart the one flavor associated with briquettes. The addition of wood chips to a charcoal grill can add some notes of flavor, but not with the consistency or quality that you might hope for. Wood pellets come in several varieties, offering a range of flavors you can choose from. These flavors include apple, cherry, hickory, maple, mesquite, oak, pecan, and more. Using wood pellets as fuel allows for easy customization, as certain hardwoods complement specific foods. The versatility of pellets and pellet flavors is never ending, especially with the Pro and Elite models’ dual pellet hopper, which allows you to mix and match flavors! 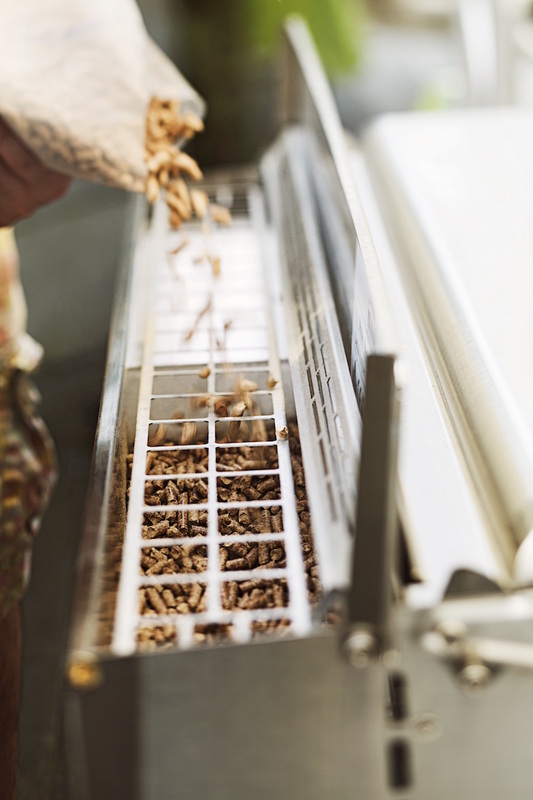 You can learn more about which pellet flavors work best with certain foods with our Pellet Guide. The primary drawback of charcoal grilling is the difficulty in controlling and repeating the results. Getting and keeping the perfect temperature can be a struggle with a charcoal grill. The one-touch Intelligent Temperature Control (ITC)™ system on your Memphis Wood Fire Grill makes it easy to control the cooking environment. It gives you the power to cook every dish to perfection. That control and repeatability are unparalleled in the world of outdoor cooking.